For the third year in a row, Los Angeles Lakers star Kobe Bryant tops the list of highest selling jerseys in Europe. Coming off his fifth NBA Title in 2010, Bryant's #24 jersey was also the most popular jersey in the U.S. and China. LeBron James moved up two spots to claim the #2 spot, while new teammate Dwyane Wade rounds out the top 3. 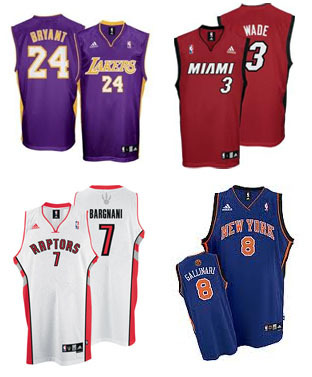 The Most Popular NBA Jerseys in Europe list is based on reported sales from retailers across Europe during the 2009-10 NBA Season. European NBA players continue to gain popularity in their homeland, grabbing six of the Top 15 spots on this year's list. They include Lakers big man Paul Gasol, Andrea Bargnani and Jose Calderon of the Toronto Raptors, Spurs Point Guard Tony Parker, Danilo Gallinari of the Knicks, and the man who paved the way for the modern European basketball import, Mavericks Forward Dirk Nowitzki. Vintage EUC NBA Miami Heat LeBron James # 6 Basketball Jersey by Adidas Men XL.